The Maidenhead Canopy is in the process of being renovated and reconstructed at Wallingford Station. Photograph above showing the Canopy at Maidenhead on possibly the last day of broad gauge running. The Maidenhead Canopy had to be removed due to the expansion needed for the CrossRail project. Ordnance survey maps of 1872 (first map above) do not show the structure but those of 1894 do (second map above). 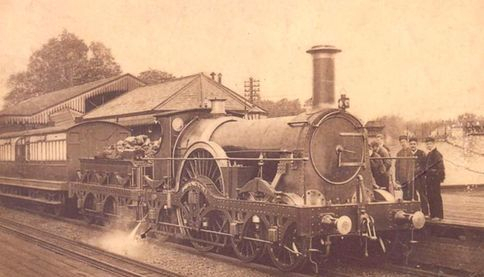 It was certainly present when Broad Gauge trains were running. Some believe it may have been moved from another site to Maidenhead and there is some evidence in the construction to support this theory. The most likely suggestions were that it may have started life at Slough or what is now Taplow but was originally called Maidenhead Riverside as Brunel’s famous bridge over the Thames had not, at this time, been constructed. Unfortunately the canopy was not dismantled in the manner that was originally proposed and when it arrived at Wallingford it was clear that its restoration by a small group of volunteers was impossible. However the importance of the structure as one of the few remaining Brunellian sheds attracted the attention of the Railway Heritage Trust (RHT). The RHT funded an initial survey by the Morton Partnership that was completed in 2015 and an application was successfully submitted to the RHT to fund the restoration and eventual erection at Wallingford. Read the latest updates on progress here.